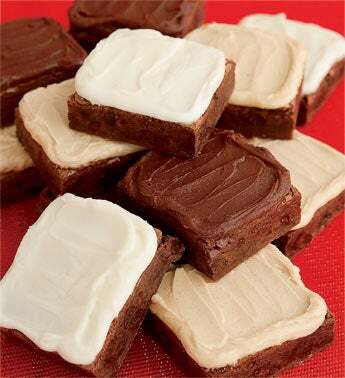 Brownies became a favorite treat of the United States and Canada during the first half of the 20th century. With a texture resembling a cross between a cake and cookie, the brownie has come a long way from the first example to appear in public. A chef at the Palmer House Hotel in Chicago, Illinois created the sweet treat using walnuts and an apricot glaze. The original recipe is still being served at the hotel. When you wish to create your own brownie magic, consider the following tips for baking brownies. If you want to make brownies with an even texture, use the correct sized pan stated in the recipe. If you use a different pan, the brownies will form a different texture. If you over-bake your brownies, they will become dry. Make sure to follow the recommended baking time listed in the recipe to enjoy moist and chewy brownies. For better results, it is suggested to hand-mix your brownies and avoid using an electric mixer. To minimize the amount of clean up after making your brownies, line your pan with aluminum foil. Once the brownies have cooled, they will lift straight out of the pan, which makes it easier to cut into uniform squares. Not only are crumbly brownies messy, but they also lessen the overall appearance of a fresh plate. To prevent crumbling, completely cool your brownies before cutting into squares. To make brownie bars with smooth sides, make sure your treats have thoroughly cooled before cutting with a plastic knife. To add a little something extra to your brownies, there are many different toppings to consider. For starters, you can sprinkle powdered sugar on unfrosted brownie bars. Chocolate curls on top of frosted bars add a hint of elegance. Other toppings for brownies include mini chocolate chips, nuts, and colorful sprinkles for kids. If you’d like to make decadent brownies for your next get-together, combine 1/3 cup of coarsely chopped white chocolate and two teaspoons of vegetable shortening in a small, heavy saucepan. Melt the ingredients over low heat – making sure to constantly stir. Drizzle over your brownies. A popular dessert offered at restaurants is brownie a la mode, which means that your treat is warmed and served with ice cream topped with whipped cream. When it comes to holiday sweet treats, sugar cookies are a popular choice. Whether unfrosted with colored sprinkles or covered with icing, these seemingly simple treats don’t always turn out as planned. Sugar cookies are also a favorite because it gives people the chance to make use out of their cookie cutters, and the variety of shapes are neverending. To make sure you serve the very best holiday treats, consider the following tips to making better sugar cookies. Let’s say you want to dust off some of your Christmas cookie cutters. One of the first mistakes many people make with their sugar cookies is with the recipe. There is a difference between a “sugar cookie” and “cut out sugar cookie” recipe. The average recipe for soft and chewy sugar cookies will not produce the type of cookies you seek. Before starting out, make sure you are following a “cut out sugar cookie” recipe, which creates sturdier results. Before rolling out your dough, it must be cold – especially right before you pop them into the oven. After they have rolled out their dough, some people will wrap it in parchment paper and place in the refrigerator for two hours to chill. Even after cutting out your shapes, it is suggested to place the cookies in the fridge for at least 15 minutes. There is no need to grease your cookie sheet. Refrain from using any butter, oil, cooking spray, parchment paper, or silicone mat on the sheet. Do not place your sugar cookies on a warm baking sheet. The heat will start to melt your dough before it’s even placed inside the oven. Before icing your sugar cookies, make sure that they have completely cooled off. If you would like to color your icing, add food color to your recipe, but keep in mind that the colors will dry slightly lighter. Select icing colors that are a bit darker. Allow your iced cookies to completely dry for about four hours before you attempt any design work. If you try to decorate while the icing is still wet, the colors will bleed. Whether you enjoy international holiday customs or like discovering the sweetness of another culture, Russia is certainly a prime candidate for sampling unique desserts. A great deal of Russian desserts display influences from Western European countries – a trend jumpstarted during the 18th century by Peter the Great’s affection for the history of the Dutch, Germans, Swedes, and the French. Served during the Easter season, Paskha is a traditional dessert comprised of soft cheese and dried fruit. The whiteness of the soft cheese is used to symbolize the purity of Christ and the Pashal lamb. Other ingredients added to the dessert may include butter, eggs, sour cream, almonds, vanilla, raisins, spices, and candied fruits. Baked desserts are also popular in Russia. Vareniki are small sweet pies and dumplings filled with preserved fruit (or tvorog – a dry soft cheese). Vareniki are often served as a sweet luncheon dish or as an accompaniment for afternoon tea. It is suggested to serve this treat with sour cream and sugar. A ring of dough offers the shape of a cake called vatrushk, which possesses a center made out of tvorog (cottage cheese). Sometimes, raisins or small pieces of fruit are part of the ingredient list. The cake can measure from around five inches to two and a half feet in diameter. Also called a “Russian pancake,” blinis are a thin creation that looks much like a crepe. However, yeast is used to make blini, whereas crepes do not possess this ingredient. Traditional Russian blini use yeasted batter, which is left to rise, and then later diluted with cold or boiling water (or milk). The pancakes are then baked in an oven or pan-fried. The pancakes are often served with sour cream, jam or condensed milk. An example of fried blini is shown above. Another fried pancake dessert in Russia is called syrniki (also referred to as “tvorog burgers”) because they are made of tvorog cheese, and then fried in a saucepan – like a hamburger. Sometimes, raisins are added to the cheese mixture for extra flavor. Syrniki is usually paired with honey, sweet dressings, apple sauce, or jam.